Learn how to make Mexican folk art! 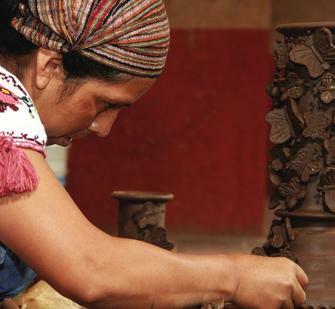 Join Herlinda Morales, an internationally recognized Purepecha master artisan who creates intricate, lead-free, black glazed ceramics with her family in the small, traditional village of Santa Fe de La Laguna, Lake Patzcuaro, Michoacan. You will learn to make your own exquisite tableware, incorporating Herlinda’s signature design, the whimsical butterfly. Open to all ages and level of experience. Space is limited. This workshopis presented in conjunction with the exhibition Mountains in my Spoon: Artists and Food at the Lucas Artists Residency on view at the Project Space Gallery October 18, 2012 through February 9, 2014. The exhibition and related events are organized in association with Around the Table: food, creativity, community, a South Bay festival of food and the arts extending from July 2013 through April 2014. Featuring a flagship exhibition at the San Jose Museum of Art and accompanying festival of activities presented by thirty partnering organizations, Around the Table celebrates and explores the role that food plays in our lives. Join us after the workshop in the Carriage House Theatre for a screening of the award-winning documentary about Mexican ceramics artisans, Brilliant Soil.